by 2209patrick Today, mention of the name Christofle evokes both the elegance of a bygone era and the concept of innovative modern design. The story of this renowned firm dates from 1830 when the young Charles Christofle (1805 -1863) took the reins of his family's small jewelry workshop in the Marais district of Paris. Over the next ten years, with the financial backing of his wealthy sister, Mme. Rosine Bouilhet-Christofle, Charles used his keen managerial skills to enlarge the enterprise and win commissions at home in France and from as far afield as Madagascar and South America. A business visionary, Charles made a brilliant strategic move came in 1842 when he negotiated a license giving him the French rights to the electroplating patents of George and Richard Elkington of Birmingham, England. This, along with the patents of the French chemist Count Henri de Ruolz, enabled Christofle, in 1844, to build a technologically advanced manufacturing plant for plated goods. This step firmly embarked Christofle on its legendary course as manufacturing silversmiths. During the early years of the plant's operation, the unplated metalwork was often made by other firms. 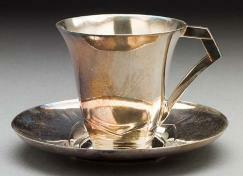 To Christofle, quality was key and he soon began his own manufactory to create his own forms. The firm employed only skilled workmen and talented designers & sculptors, including; Mathurin Moreau (1821-1912), Émile Reiber (1826-1893) and Auguste Madroux (d.1870). By the early 1850s, Charles added a line of solid silverware to complement the plated goods. He promoted the firm by exhibiting in international expositions where Christofle consistently won critical praise and medals of honor. This acclaim led to important commissions at home and abroad, such as services for Emperor Napoleon III of France, the Sultan Abdulaziz of the Ottoman Empire and later for Emperor Maximilian of Mexico. Once ensconced as silversmiths to royalty, the aristocracy and bourgeoisie soon fell into line as avid consumers of Christofle tableware. By the time of his death in 1863, Charles Christofle had guided his family's firm from a small jewelry workshop to an industrial leader in the field of silverware manufacture with plants in France and Germany and retail outlets throughout Europe and in North, Central & South America and the Russian & Ottoman Empires. The curvilinear shape of this commemorative plaquette captures the essence of the Art Nouveau style. Albert-Ernest Carriere-Belleuse (1824-1887), F. L. Joindy (1832-1906), Rene Rozet (b.1859) and the great Alphonse Mucha (1860-1939). One of their most important steps was the creation of the Gallia line. This trademark name applied to a new alloy, similar to pewter but more durable, Gallia metal was ideally suited to casting and less expensive to manufacture and plate. The Gallia line opened a new market of high quality goods at more affordable prices. The early years of the 20th century brought hard times for Christofle. The political disarray and economic depression following World War I combined with management by a series of short lived family members not only precipitated the loss of the Karlsruhe factory in Germany but brought the company close to financial collapse. It was not until 1932, when Tony Bouilhet (1897-1984) inherited the reins of the business, that a true revival began. Tony was the great-grandson of Mme. Rosine Bouilhet-Christofle and the great-grandnephew of the founder, Charles Christofle. Tony Bouilhet had married Carla Borletti (1907-1992) of a wealthy Milanese industrialist family, the Borlettis provided needed capital by becoming major shareholders when Chistofle incorporated in 1930. Carla Borletti had exceptional taste and used her influence to guide the firm into commissioning designs from some of the most gifted industrial designers, architects and sculptors of the 20th century. Among the most sought after pieces created by Christofle are: the Art Deco designs by Christian Fjerdingstad of Denmark, Gio Ponti of Italy, and Edouard-Marcel Sandoz, Süe et Mare, Paul Follot & Luc Lanel of France; the Mid-Century Modern designs of Tapio Wirkkala of Finland & Lino Sabattini of Italy and the Post-Modern work of Roger Tallon & Andree Putnam of France and Gae Aulenti of Italy. Retail expansion continued throughout the 20th century, by its end, Christofle was operating 75 Pavillon Christofle retail stores as well as Christofle in-store Boutiques in 400 larger department stores located in 120 countries. Christofle et Cie, 19th Cent. An early example of Christofle plated flatware, made and marked by Alfenide, plated and marked by Christfle. The "55" indicates the thickness of the plating. In 1993, the son of Tony and Carla, Albert Bouilhet, who had headed the company since 1968, asked his young first cousin, Maurizio Borletti, to lead the firm. Today, Christofle is in the hands of the family's 5th generation and continues their tradition as purveyors of fine design and superior quality in elegant tableware. The above marks have proved difficult to date beyond a rough estimation of late 19th to early 20th Century. 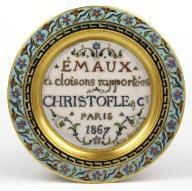 With hope of more precise dating, the curator of the Musée Bouilhet-Christofle was contacted in November of 2007. At publication, we are awaiting response, and will update the article should the information be made available. International Directory of Company Histories, Vol. 71.